Hopes for good late season conditions were thwarted by another major thaw in March. 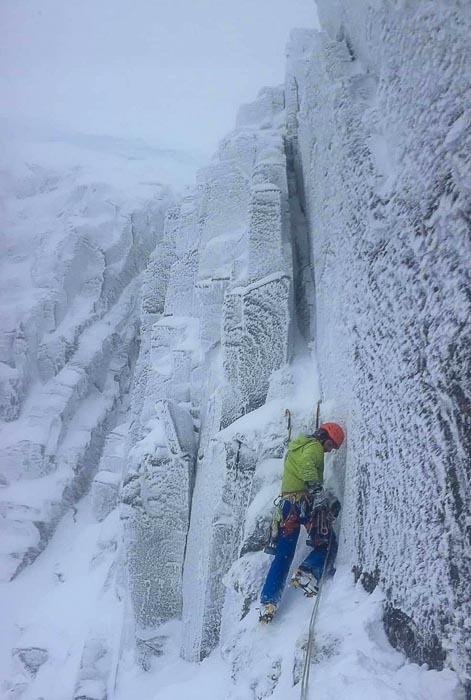 By way of compensation, a heavy snowfall in the Cairngorms followed by a helpful thaw-freeze cycle brought the easier north-facing gullies into condition and several teams enjoyed romping up the easier classics in the Northern Corries. Across on the West conditions were leaner. The most popular technical route on the Ben was Gardyloo Gully, which provided a sporting Grade III. In many ways, extremely lean conditions are the best time to climb this classic route as it is often blocked by a monstrous cornice. Ascents were also made of Glover’s Chimney, Central Gully Right-Hand and Tower Scoop. A strong French team backed off the third pitch of Point Five Gully. 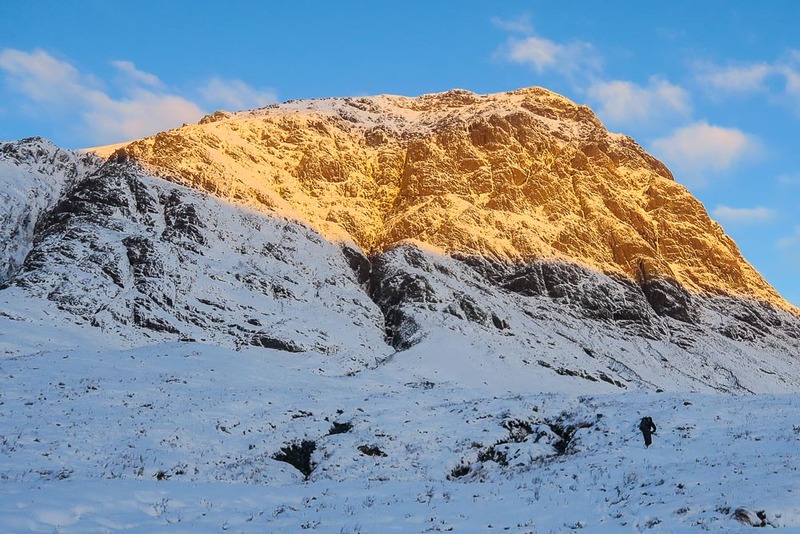 To maintain the winter psyche until next season (just six months away), Robert Taylor has put together a set of podcasts interviewing current activists about their Scottish winter and mountaineering exploits. So far Robert has interviewed Simon Yearsley, Helen Rennard, Robbie Phillips and myself. Paul Diffley of Hot Aches Productions has also very kindly made available the full audio of his interview with Jimmy Marshall. 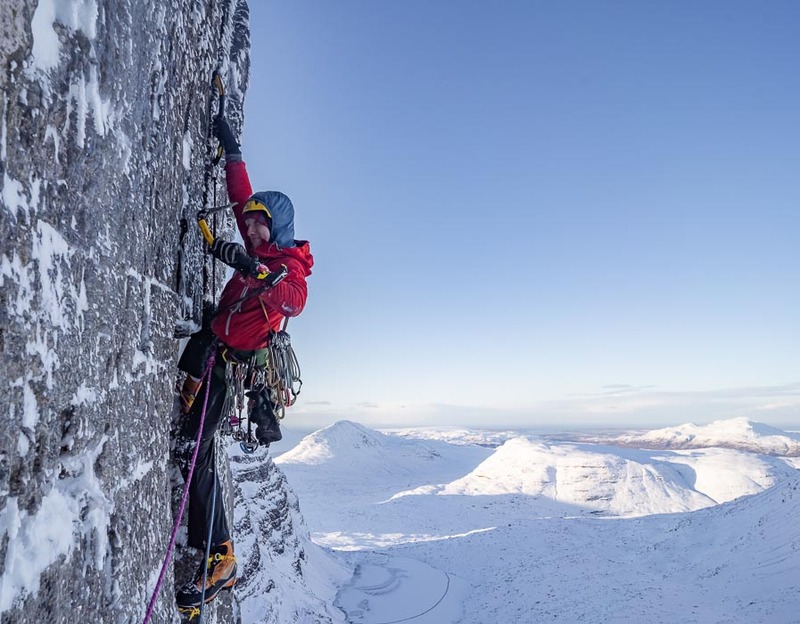 On March 16, Jamie Skelton and Matt Glenn made the second winter ascent of Feast of the East (VIII,9) on the Eastern Ramparts on Beinn Eighe. 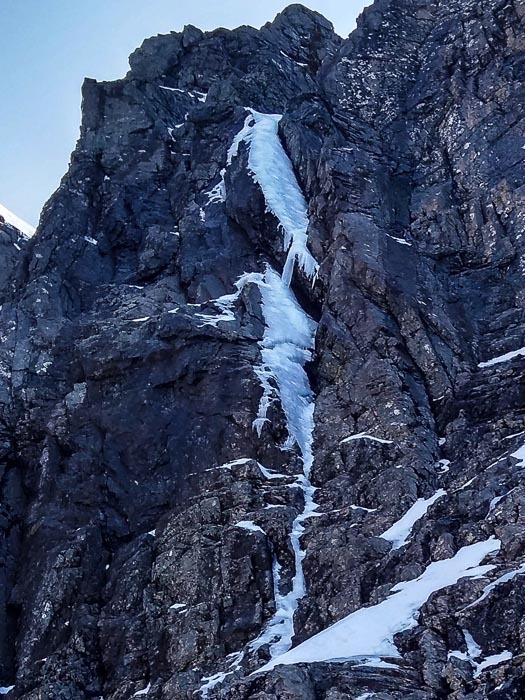 The route was first climbed by Andy Nisbet and Gill Ollerhead in May 1992, and the first winter ascent fell to Martin Moran, Murdoch Jamieson and Francis Blunt in December 2011. “Myself and my friend Matt Glenn got pretty excited after reading about Heavy Flak and Shiva getting done recently and started scanning for other routes in the same area,” Jamie told me. “We decided to have a go at Feast of the East which is a four-pitch route on the Eastern Ramparts. We found some really steep but positive climbing through well-defined cracks and corners. I lost the game of rock-paper-scissors so Matt went first. Initially the first half of the first pitch went well with gear and big hooks. After that there was a delicate section to negotiate, to get around a small projecting roof as for the summer route, first to the right, and then back left on flat ledges. This then led onto the big ledge below the main event – the pitch off the ledge is a summer 5c – it’s short and packs a punch. It follows a right-facing corner, which passes two large roofs on small positive hooks and good gear, however it is void of any really footholds making for an extremely strenuous series of footless pulls (possibly soft tech 9) to gain the small ledge. Jamie and Matt have had a very successful season with ascents of Ventricle (VII,8), Darth Vader (VII,7), Sioux Wall (VIII,8) and the second ascent of Shapeshifter (VIII,8). In addition, Jamie has made ascents of Daddy Longlegs (VIII,9) with Jack Morris, and the hard test pieces of The Needle (VIII,8) and Centurion (VIII,8) with Tim Miller. Given the difficult season we have had this is a remarkable collection of routes! Strong winds and frequent snowfall have resulted some very dangerous snow conditions recently, especially on the West. 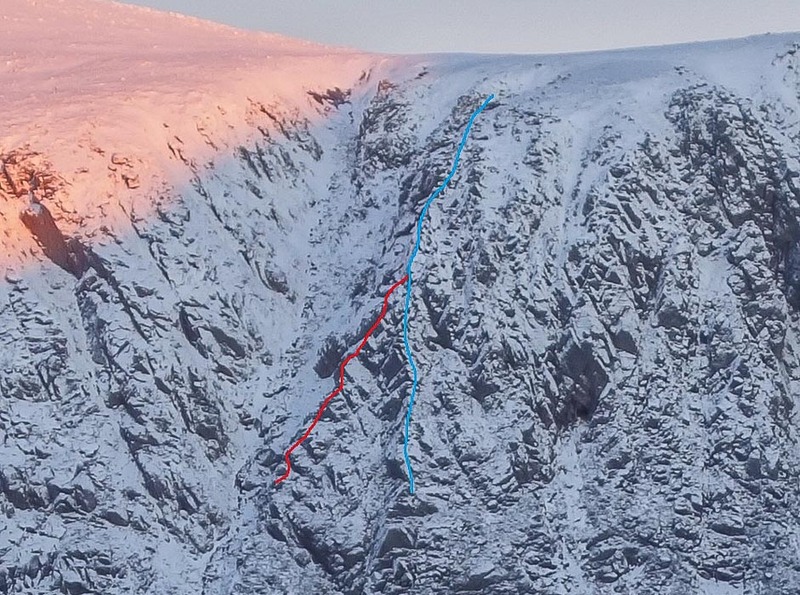 On March 8, Graham Wyllie and Cam Bevan visited Coire an Lochain on Aonach Mor. Conditions were tricky, but careful route choice meant they came away with a good two-pitch new route called Moonpig (IV,5) on the right side of the corrie. Without question, it has been a dismal Scottish winter season. 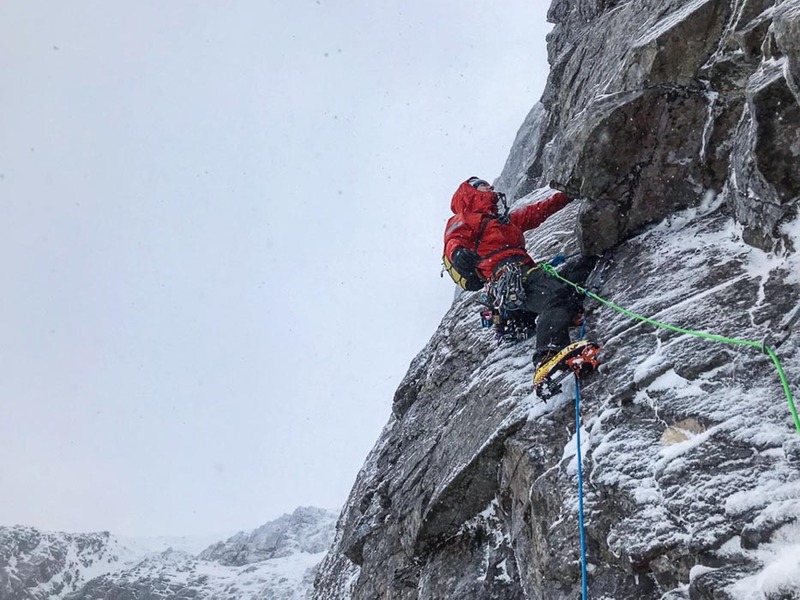 The warm weather through most of the peak winter climbing period in February upset many people’s dreams, and the tragic loss of Andy Nisbet and Steve Perry coupled with the recent fatalities in Glen Coe and Ben Nevis has only made things worse. The wind has been taken out of many people’s sails, and the current stormy weather giving rise to dangerous avalanche conditions is just adding to the gloom. I received an email the other day from Graham Wyllie about a possible new start to Afterthought Arête on Stag Rocks that helped to lift my spirits. The route is such an obvious line that it is surprising it has not been recorded before. New ascents in plain sight such as this make me smile, as it seems incredible that nobody has been there before. John Lyall, who knows the crag well, agrees that there is no record of an ascent, but wonders whether it was not noted before because it is escapable into the gully on the left. This is a real possibility, but there again, folk are climbing routes in leaner conditions nowadays which tends to make lines more distinct. So if anyone has climbed the line before, please get in touch (email or add a comment) so we can set the record straight. Graham and Ryan have provisionally called their new addition Neverthought Arête and graded it III,4. 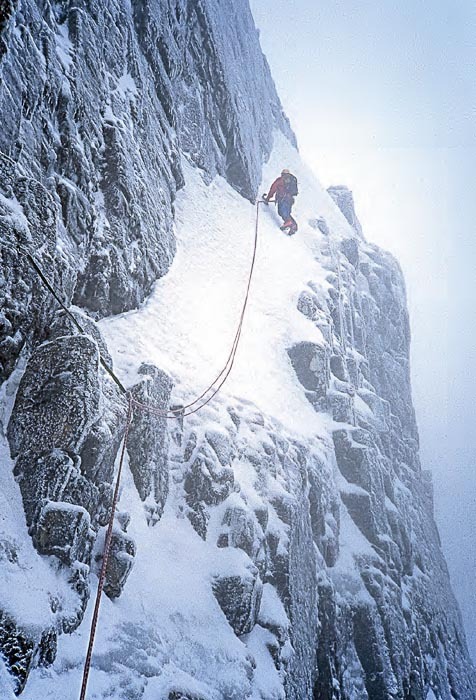 Grahame Nicoll’s atmospheric photograph of Alex Runciman perched above the misty void on Number Three Gully Buttress (III) on Ben Nevis is one of my favourite winter climbing images. It is no coincidence that it was published in both the 1994 SMC Ben Nevis guidebook and Chasing the Ephemeral. 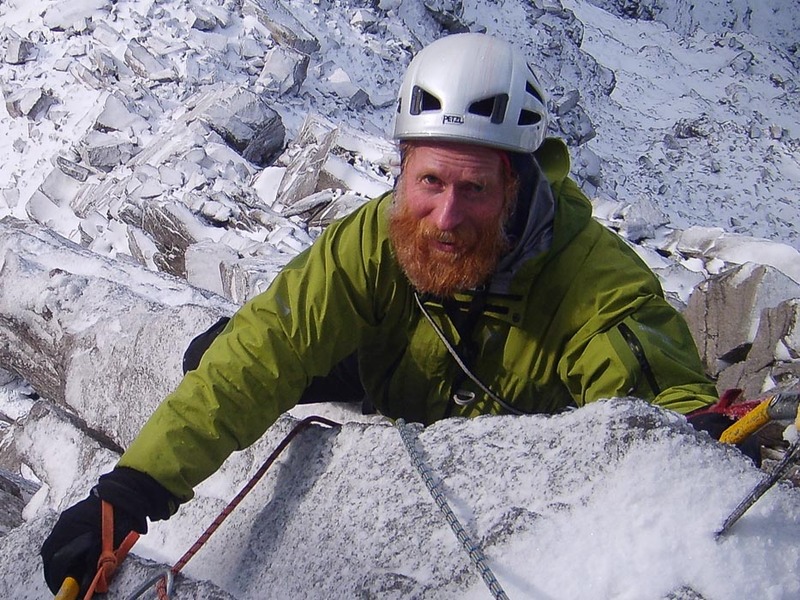 Unfortunately after a short illness, Alex died earlier this month, and Scottish winter climbing lost one of its most enthusiastic devotees. Alex was a joiner by profession, but his lifelong love of the outdoors led him to found a series of outdoor shops in Scotland. The first was the iconic Mountain Man Supplies in his hometown of Perth, which led to further shops in Ullapool, Aviemore and Braemar. The early success of the business was attributed to Alex’s unbounded enthusiasm – it was said that you would go into his shop to buy a pair of socks but inspired by Alex’s passion for the mountains you would leave with a full set of kit! Alex was a Scottish mountaineer through and through. He completed three rounds of the Munros and climbed many of Scotland’s winter classics. He was particularly fond of climbing on Ben Nevis where his joinery skills were used to fit new windows in the CIC Hut – a major job. Alex also developed a liking for climbing in the Southern Cairngorms and particularly on Beinn a’Bhuird. 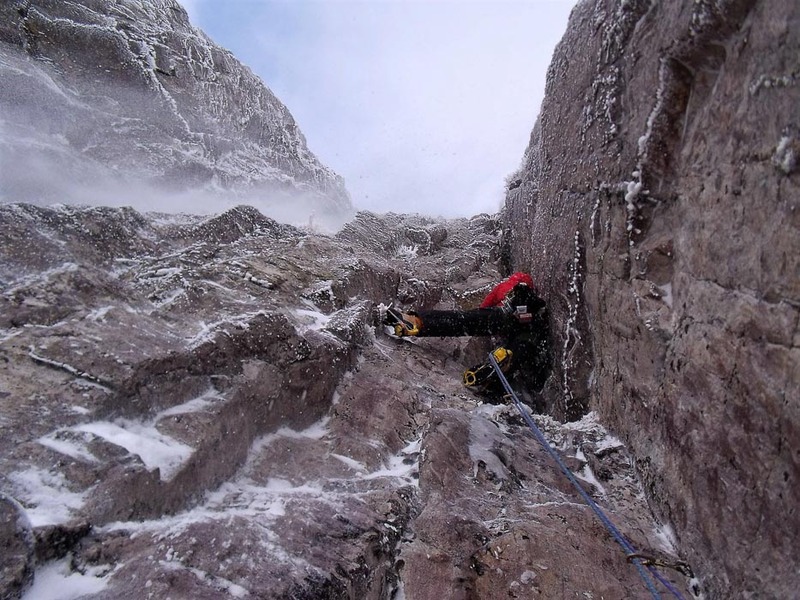 He added several new routes to Coire an Dubh Lochain and Dividing Buttress, but the only one that is recorded is the first winter ascent of Tearaway (IV,3). For Alex it was all about being in the mountains rather than personal glory. Alex was a generous man and took great interest in the routes Chris Cartwright and I were climbing in the early 2000s. He kitted us out for a remote expedition to Canada, and on another occasion Chris turned up below Ben Cruachan with a cardboard box with a set of brand new ice tools for us each. Alex said he liked what we were doing and wanted to contribute, if only in a small way. But my abiding memories of Alex are his broad smile, bright eyes, and infectious enthusiasm. The Scottish hills are all the less for his passing. Murdoch Jamieson and Uisdean Hawthorn pulled of a notable first winter ascent when they climbed Heavy Flak on Beinn Eighe on February 2. This summer E1 on the Eastern Ramparts was first climbed by Geoff Cohen and Murray Hamilton in July 1978. “We climbed it in three pitches,” Murdoch told me. “I took the first pitch which ascends the right side of the roof to a little ledge. I think the summer description says traverse in from the right, which would make sense. Under the roof it was icy and dirty, and in summer I suspect it would be rather loose. It was a bit committing to leave this little ledge and gain the crack but I was fine once established. It was just pumpy. Uisdean took us up the summer 5b pitch. It looked mental from below but this pitch was made for modern hooking with sinker hooks and good thin cracks for mono points. All that said, it was still very pumpy. The top pitch however was probably the crux. An icy wall with some very steep strenuous moves led to a groove. I’m glad I’m tall as it was a long reach to the ice, but once in the groove the ice was fairly good. It was runout so maybe it felt harder than it should have done given the quality of the ice. Overall, we think the route was harder than Boggle, but probably still in the VIII,8 Grade. The heavy snowfall at the end of January fell without any wind and coated the Scottish mountains with a uniform layer of powder snow. This was a boon for skiers, but for classic winter climbing it needed to consolidate a little. Fortunately, the cold was intense, and soon permeated the fluffy light snow and rapidly froze the turf below. This combination of deep snow and frozen conditions created a brief window of opportunity on southerly aspects before the February sun started stripping it all. On February 1, Iain Small and I were in Glen Coe and attracted to the idea of a winter route on the South-East Face of Buachaille Etive Mor. This myriad of buttresses and gullies is rarely visited in summer, and hardly ever in winter. We hummed and hawed about exactly what to do and where to climb on the face, but after looking through binoculars Iain spotted a continuous line of white on the north-east flank of North Blackmount Buttress. Fortunately Iain knew the area well (although rather modestly he claimed he didn’t) as he had added a handful of new E4s and E5s on the face in recent summers. Most importantly, Iain knew that The Chasm to Crowberry Traverse, which was first climbed by Glover and Collinson in April 1898 and takes a rising traverse across the face, was the key to reaching our buttress. Glover and Collinson’s route was one of the first climbs to be recorded on the Buachaille, and following its well-defined line up short gullies and terraces interspersed with short walls was a fulfilling outing in itself. 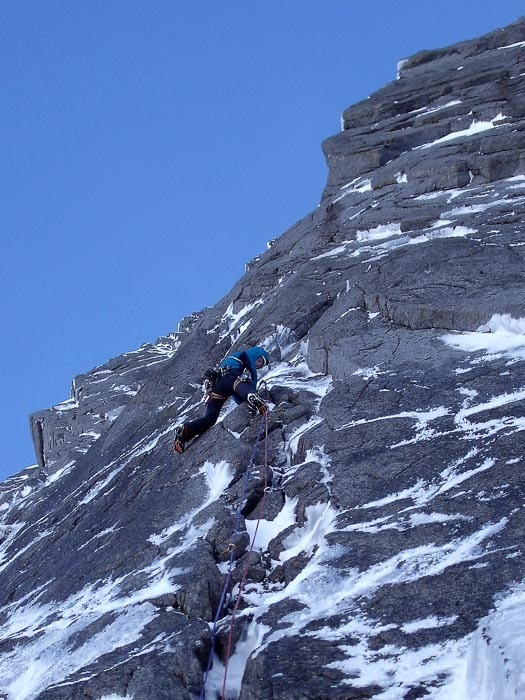 Iain’s hunch that there was a good line on North Blackmount Buttress was correct, and we climbed three excellent sustained pitches with a bold crux through a difficult to protect roof at half-height. The route was sheltered from the sun, and the upper pitch following well-cracked grooves in an exposed position on the upper crest of the buttress was a delight. The party climbing Curved Ridge above and to our right must have wondered what route we were doing. We coiled our ropes on the flat top of the buttress and then traversed across a snow slope before plunging down through deep powder on the upper part of The Chasm to Crowberry Traverse to regain our steps and the conclusion of a satisfying day.